Ah Quon McElrath holds a "Save Our Star-Bulletin" button in front of the Federal Court building. 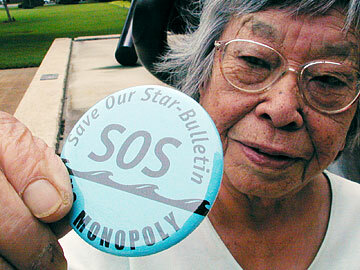 SOS was created to help stop the dissolution of the joint operating agreement with the Honolulu Advertiser. FORMER LT. GOV. JEAN KING is proud to say she helped keep Honolulu a two-newspaper town. "I really feel it's worthwhile for us to have succeeded," said King, an instrumental member of the citizen's group Save Our Star-Bulletin, which was formed in 1999 after the newspaper's former owner announced that the Star-Bulletin would close. On the fifth anniversary of the Star-Bulletin under new ownership, King says she is happy to see that the newspaper is still around. "This kind of competition is good," she said. "It keeps both papers on their toes." Former Gov. Ben Cayetano agreed, saying he appreciates "the fact that Hawaii still has two major daily newspapers." The state -- under Cayetano's insistence -- filed suit with Save Our Star-Bulletin to stop the dissolution of a joint operating agreement with the Honolulu Advertiser. The suit was later ruled moot after the Star-Bulletin's former owner, Liberty Newspapers LP, and the Advertiser owner, Gannett Co., agreed to put the Star-Bulletin up for sale. "Personally, I had little reason to help the Star-Bulletin. I felt the SB had not been fair to my administration. But it would have been wrong to let my personal feelings guide my decision." "Personally, I had little reason to help the Star-Bulletin," Cayetano said in a recent e-mail. "I felt the SB had not been fair to my administration. But it would have been wrong to let my personal feelings guide my decision." He added: "The only reason I decided that the state should help was that I believed strongly it was in the public's interest to have at least two newspapers, two editorial voices. "Would I do it again? Of course -- and for the same reason." Cayetano said the Star-Bulletin has "gotten better" during the past five years and provides a vital public service with its online back issues dating to 1996. "The SB does well when it takes risks and the lead on investigative reporting," he said, adding that there is no "significant difference" between the two newspapers. Two months before the state filed its antitrust lawsuit, Cayetano told a group of reporters at a brown-bag luncheon that he couldn't "care less if there is one or two papers in the state." The statement followed an afternoon of sharp criticism against Honolulu's two dailies. Cayetano's sudden turnaround was unexpected but welcomed by Star-Bulletin supporters. King said she is glad that when Cayetano "got the facts, he changed his mind." King said what she most remembers about the efforts to keep the Star-Bulletin open was getting overwhelming support from the community. She and others in Save Our Star-Bulletin were able to get backing from several neighborhood boards, the former mayor and County Councils. One weekend, she talked to tailgaters at Aloha Stadium and was able to get dozens of signatures for a petition. "It was just kind of a strong, popular, supportive response," she said.